I was recently told a “dirty little secret” about regular body washes. They actually can cause dry skin damage! Who knew? Without getting too technical the reason why they cause damage is because they damage the proteins and lipids in the skin’s outer layer which leads to a critical loss of the skin’s moisture. This in turn causes irritation, dryness, and tightness of the skin. Some of the other body washes out there focus on minimizing protein damage and hiding the symptoms of moisture loss by adding heavy moisturizing ingredients that just sit on top of the skin. So you won’t even realize that you are damaging your skin! Dove has introduced a new body wash that will restore your skin’s natural moisture ten layers deep. It contains NutriumMoisture technology and this one of a kind formula will preserve both proteins and lipids during the cleansing process. So while other moisturizing body washes only sit on top of your skin, Dove Body Washes with NutriumMoisture will nourish your skin deep down. I was sent all three of Dove’s new body washes with this breakthrough technology- Deep Moisture, Gentle Exfoliating and Sensitive Skin. I have used Dove’s products in the past and always liked how gentle they were on my sensitive skin. I gave the bottle of Gentle Exfoliating Body Wash to John’s mom to try out and see what she thought of it. She loved it and found it to be very luxurious. She enjoyed the rich lather and how it made her skin feel nice and soft. I tried the other two- Deep Moisture and Sensitive Skin. Both are excellent choices! Sensitive Skin is my favourite and I can say that my skin felt wonderfully clean and super soft after using it. This is a fabulous new product from Dove! Highly recommended! 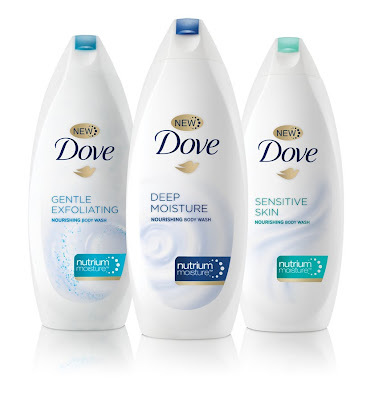 The Dove Body Wash with NutriumMoisture collection can be found in food, drug, club and mass retailers. I find the Dove foams up fairly nice but I’m not a fond of the scent because I prefer something with a fruity scent.